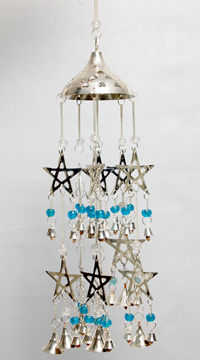 Wind Chime Silver Plated Pentacle 15"
Please email orders@wicca.com to contact us about stock availability, shipping and delivery information, order problems or any questions and comments you may have about our store. We don't have catalogs sorry! We usually respond to emails within 24-48 business hours. However, we occasionally participate in fairs or other events and may be out of the office for up to 3 days.